The Forgetting Curve	Get Your Kids Moving! But those from poverty can (and often do) succeed. It is happening everywhere. The schools that succeed with those from poverty are doing the right things, doing them over time and, as a result, changing young brains for the better. In addition, for your school to succeed with kids from poverty, you’ll want to understand how poverty changes the brain and use that knowledge to guide educational practices. How are Brains of those from Poverty Different? The effects of poverty on any human being are truly staggering. In short, the kids are different because their brains are different. Our neurons are designed by nature to reflect their environment, not to “automatically” rise above it. Areas of the brain that are affected by chronic exposure to poverty include those responsible for working memory, impulse regulation, visuospatial, language and cognitive capacity and conflict (Noble, et al. 2005). Brain based learning is knowing how our brain works, then using that to foster better student outcomes. Now let’s explore what it will take. Evidence suggests children of poverty are more likely to have “different brains” via four primary types of experiences. They are: 1) exposure to toxins, and 2) chronic stress 3) chronic exposure to substandard cognitive skills and 4) impaired emotional-social relationships. While not every single low SES child will experience all of these factors, the majority will. Let’s do a super-quick overview of each. Live on or near toxic waste sites (Brody et al., 1993). Live in areas that did not meet one or more of the Air Quality Standards (EPA 2000). Have greater exposure to lead (Brody et al., 1993). Have more exposure to cigarette smoke. (Childstats, 1999). These are relevant because, for example, high levels of lead are dangerous to children because they can cause neurological and developmental impairment. The behaviors we see in the classroom may be a result of years of toxic buildup. The aggregate of exposure to multiple toxins creates damage to the brain, which manifests in behavioral, cognitive, emotional and social ways. It is the aggregate of factors that ultimately prove challenging to overcome, not any single one. IMPLICATIONS: There are very few things that can counter the effects of toxins in the body. Animal and human studies suggest that an enrichment program does the closest to creating miracles. You’ll learn more about what to put in the enrichment program later in this report. Chronic stress creates an adjustment in the body’s “stress point” in the same way that we can create a different “set point” for eating and hunger signals. An example of an altered set point is PTSD or depression. This altered set point is known as allostatic loads, from the Greek word “allostasis” meaning “adjusted stability.” This devastating change is actually long-term, carry- over stress that continues day after day. Those living in poverty experience a chronic stress overload greater than in their higher socioeconomic class (SES) counterparts. (Almeida, et al. 2005). How, specifically, are kids from lower SES affected by stress as compared to those of middle or upper income? This is an essential learning for brain-based advocates. Poor families move twice as often, get evicted five times as much (Federman et al., 1996). Children of poverty face 50 percent more street crossings with a six times greater risk in pedestrian accidents (McPherson et al., 1998). Poor children have more contact with aggressive peers (Sinclair et al., 1994). They experience more community violence; from an unsafe home neighborhood or a dangerous path to school which can hurt academic performance (Schwartz & Gorman, 2003). Greater safety concerns, leading to academic underperformance (Pratt et al., 1997). worse food choices because appetite and eating habits becomes altered by chronically higher levels of cortisol. (Cartwright, et al., 2003). One study actually gave randomized, double blind, placebo-controlled, fixed oral doses of cortisol (a chemical associated with stress) and the placebo (colored water) to subjects. After several days of exposure, the researchers found that the cortisol treatment reversibly decreased specific elements of memory performance in otherwise healthy individuals (Newcomer et al.,1999). Other studies highlight the effects of chronic stress on the school-age brain. This allostatic load increases the likelihood that kids from poverty will emotional problems (Burgess et al., 1995), lowers IQ and reading scores (Delaney-Black, et al. 2002), and significant memory loss (Lupien, et al. 2001). Chronic stress is clearly bad and humans respond with adaptive allostatic loads in one of two ways: we become more angry and aggressive or, we become much more passive, even helpless (Johnston-Brooks, et al., 1998). This understanding helps educators realize that the frustrating behaviors they see in the classroom from kids from poverty (aggressiveness or giving up) are not causing their problems—they are the symptoms of their problems (Sapolsky, 2005). This is fundamental change for many educators–moving away from a blaming mentality and getting to work being an ally for their students. IMPLICATIONS: Brain based learning is knowing how our brain works, then using that to foster better student outcomes. First, the behaviors that ineffective teachers commonly report from kids from poverty include: listlessness (unwillingness to participate), defensiveness (inability to take feedback), verbal abuse (use of profanity), arrogance (“I don’t need your help!”) and impulsivity (lack of planning or foresight) are ALL symptoms of stress disorders. They are NOT attitude issues (unless you are talking about a teacher’s attitude). Tell staff to quit judging and start with empathy (not sympathy). Second, kids can change, but only if conditions around them change. You’ll learn how to do that later in this report. Parents from poverty use different vocabulary words every day, both fewer and less complex than those heard in families of greater income (Hoff, 2003). Poor children are more likely to have parents that are less likely (by a factor of three or four) to initiate conversation just to maintain social contact or build vocabulary (Hart & Risley, 1995). Low SES parents are only half as likely to read to their kids as compared to high-income children (Coley, 2002). Have lower quality of nutritional intake in low-income infants and toddlers, which is linked to lower cognition (Frank et al., 1995). These issues are relevant because, for example, while children from poverty typically have cognitive deficits, they can be improved with specific skill- building programs in reading, writing, math and problem-solving. IMPLICATIONS: While the evidence is clear that kids from poverty are weaker on cognitive skills, the good news is that brains are designed to change. If kids (and siblings) have had the same boring and ineffective environments (home or school), their cognitive capacity will stay the same. Teachers must understand that whatever poor results they see are not the ceiling, but the floor for achievement. Learn how what to do about this later in the report. Brain based learning is knowing how our brain works, then acting upon it! Poor children experienced less parental support and were parented in a less responsive more authoritarian, harsher fashion than their higher income counterparts (Evans, 2004). Low SES children felt that their parents were not very interested in their activities and, as a result are less open with their parents about their feelings and (Rosenfeld, Richman and Bowen, 1998). They develop fewer social ties and have more chaos, stress, and disruption in their lives (Jensen et al., 1983). Kids in these homes also hear less responsive, fewer supportive, and less interactive conversations among others in their homes (Hart & Risley, 1995). Poor parents are half as likely as professional parents to be able to track down their children playing in the neighborhood (Evans, 2004). Poor parents are more likely to leave their children home alone for extended periods of time, regulate the amount of television their kids watch (Bradley and Corwyn, 2002). All of the disconnect in relationships takes its toll. Children from poverty believe themselves to have fewer friends and have lower acceptance among their peers (Rosenfeld, Richman and Bowen, 1998). Unfortunately, children from poverty are much more likely than their counterparts to have impaired relationships. This can affect self-esteem and even influence their everyday choices of those whom they’d like to have as friends. And, once at school, their peers are a greater influence on their lives than their parents (Harris, 1998). But remember that chronic stress is a key factor and it increases likelihood of inappropriate attachments (Schore, A. 2002). This creates vicious cycle where poor kids lack the grounded strong quality home relationships, yet, they are more likely to seek the wrong ones at school. Good relationships lower stress, provide guidance and support. IMPLICATIONS: There are clear examples of how poor relationships affect kids from poverty. For example, in the classroom, they may be less hopeful about their future and more stressed. This suggests that schools that succeed will have to address this issue. Brain based learning is knowing how our brain works, then embedding that learning into the strategies of your work. Can Those From Poverty Succeed? The neurobiological evidence may sound pretty depressing, but there’s hope. Brains are designed to respond to experiences, both good and bad. What follows may be hard to swallow: brains are designed only to adapt and reflect their environment. If your students are not changing for the better, they are reflecting a substandard or non-enriched environment at your school. You do have enough hours per week to make it happen. Stop the excuses and start believing. If I’m right, this means that that, while those from poverty may have suboptimal brains, positive experiences can (and do) change their brain. If you’re thinking that lower IQ kids cannot catch up, the research says otherwise.Researcher Harold Skeels wondered if suboptimal upbringings in young kids could be reversible. He composed an experimental “hard luck” group of 13 subjects who were designated as unsuitable for adoption and they were transferred to the institution for the mentally retarded. Skeels provided an enriched condition for these kids and also carefully documented an alternative “control group” of 12 orphanage infants who were not considered retarded. The experiment continued for three years, and then there was a follow-up. Two years after the end of the intervention (five years total), the experimental group had an average gain of 29 IQ points while the control group had a loss of 26 points (Skeels, 1966). Stop and think; this is a 54- point IQ spread! Five years later, this trend was sustained and on 30-year follow-up, the median grade in school completed was 12.0 (graduation from high school) for the experimental group vs. 2.75 (third grade) for the control group. Finally, to emphasize the dramatic differences, the 28 children of the experimental group who became parents (i.e. the next generation) had a mean IQ from school records of 104. Remember, this was the mentally retarded group! If this sounds high to you, other researchers have documented an actual 53- point achievement spread (from kids getting the worst to the best teachers, over 3 years) in schools, just from improved teaching (Sanders and Rivers, 1996). In another example, researchers found that low SES children (with an mean IQ of 77) adopted by loving parents averaged IQ gains of 8-21 points when tested eight years later (Duyme, et al., 1999). When any of your staff that says that kids can’t change…well, they don’t know their research. Yet, a school can also provide an enrichment that a quality home life could theoretically provide—if you know what to do and act on it. Other, long-term studies working with children of poverty for five years, measured multiple outcomes. Craig and Sharon Ramey, at the University of Alabama (now at Georgetown) found (1992) that they could significantly increase achievement of low SES children compared to untreated controls. Divided into two groups (one control group), the children who were exposed to the enriched environment scored significantly higher on every cognitive, emotional and social post-test, even as much as 16 years later (Wasik, et al.1990). The evidence shows brains can change if the environment is enriching. Brain based learning is knowing that our brain can change, then implementing the change in your work to foster better student outcomes. School staff needs collective “will” and belief that they can work miracles. This means that everyone on staff must be rock-solid in their beliefs about the capacity of the brain to change and their own capacity to make it happen. Staff needs to link their instructional strategies to the curriculum to get credit for the work they do. Of course, the changes have to be targeted based on clear data that will meet required standards. They are relationships, effort, cognitive capacity, behaviors and attitude. Teachers who struggle are not building the BIG 5, and those that succeed are doing it. School need to have clearly-defined, shared mission and school goals and have the relentless urgency to focus on one thing at a time. Chances are, you already do those; they’re in every book and article out there. Now, here’s what’s not in those articles that you must know to succeed. These factors may not be new to you. But then again, aspirin isn’t new either, but 20 years ago no one knew that taking a baby aspirin daily would cut risk of heart attack by 28%. Remember, it is the synergy (the use of multiple factors simultaneously) that creates the key effects. Here is the first factor. 1. Relationships are important. But certain ones that you are ignoring actually turn out to be of critical “make or break” value. Others tell you that the student-teacher relationship is critical, and they’re right. But there’s more. The relationships that students have, among and between each other, is just as important as those with teachers! These are called “mirrored relationships.” Social status (how we feel about our “place” at school) is so important, that in animal studies, lower social status reduces neurogenesis (the production of new brain cells). Neurogenesis is highly correlated with memory, mood and learning—just what lower income kids need! In short, when your students feel a distinctive social hierarchy at school, it undermines their academics! But there’s more… the relationships that your staff has among each other matter too. Not just to your staff (collaboration is always good) but to the kids. Why? Kids have a very active “mirror neuron system.” In people studies, collaboration so that everyone is on the same page. This brain system is the source of all imitative learning. It’s why yawning seems to be “contagious”). The bottom line is, when kids see a staff that collaborates, it tells their brain how to build more positive affiliations at school every day. 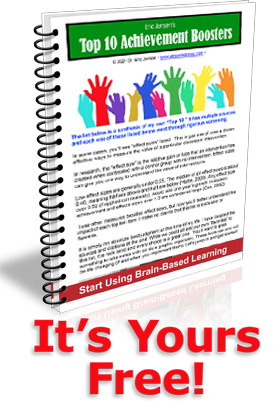 Brain based learning says we all have a social brain and are born to connect, affiliate and be influenced by our peers. ACTION STEPS: Get every single kid at your school into a mentoring program, with an adult that looks after him or her. Ensure kids have a positive, family-like homeroom climate. Give staff tools to raise kids social status (“special get to know you” activities). In short, unless relationships are good all round, it all falls apart. 2. BOOST NEUROGENESIS. I said earlier that certain events literally add new brain cells at double the rate of every other thing you can do. More brain cells are good; they are correlated positively with learning, mood and memory. All humans produce new brain cells each day; but bump up the process and you get a massive dose of cognitive-building resources. This is what is needed for kids from poverty. How do you do it? Experiments show the single factor that skyrocket’s the production of brain cells faster than anything else is… voluntary gross motor movement.ACTION STEPS: Get every single kid at your school physically active 30 minutes a day, five days a week. This helps middle and upper income kids avoid obesity, but with lower income kids, it also literally ramps up the raw materials (neurons) needed for new learning! Exercise builds neurons which support new learning and memory. . (At our 2-day “Enriching the Brains of Poverty Workshop” you’ll get five other ways guaranteed to boost neurogenesis in your kids). 3. HOPE-BUILDING. How much hope and optimism your kids feel at your school is more important for boosting achievement than their IQ or overall talent. Without the everyday feeling of hope, every other strategy you use at your school will fall flat. Yes, many things a school does may have a side effect or unintended consequence of hope building. But you can’t afford to miss this critical “sub-factor” because it empowers every other factor. Learn how to build hope and optimism in 5 simple steps. ACTION STEPS: 1) Do many small, fast, simple, clear short-term action steps to effect quick measurable changes. This builds hope and morale quickly 2) tell success stories to kids of past graduates of your school 3) ask for and affirm the student’s life dreams 4) teach how to set short-term and long-term goals and how to manage the goals 5) read powerful biographies and autobiographies of those who overcame terrible circumstances and achieved. (At our 2-day “Enriching the Brains of Poverty Workshop” you’ll get the top 10 ways guaranteed to boost hope and optimism in your kids). 4. WRAPAROUND SUPPORT. High expectations do matter, but only if your school does this one critical thing. Without it, you’ll get disillusionment and staff burnout. You can “expect a lot” all day long, but if your students have a toothache, have an immigration issue, have stomach issues, asbestos in their body, can’t make the bus to school or need medications, they cannot and will not be much of a learner. Your school will have to take on many new “hats” to wear. Your school will need to offer the services that low-income families cannot provide for themselves. You may or may not like this, but the schools that are succeeding, offer very high levels of support. When their kids come to school, they can focus on academics instead of a toothache. ACTION STEPS: Your school might need to offer consultants, mentors, resource specialists, a private psychologist, dental services and tutoring in every subject by qualified university tutors. 5. UPGRADE the BRAIN. Out of all the strategies used by high-performing schools, this one is the most fundamental. The best metaphor comes from your own computer. Years ago, the early computers like Commodore 64 or Apple IIE had such primitive operating systems that they were mostly glorified typewriters. An operating system is a cohesive set of sub-systems that work as a whole. In today’s computers, the operating system is expected to have a memory capacity, processing and sequencing capacity, stability and flexibility. In the human brain, kids from poverty typically have a substandard operating system. Their operating system was not developed properly because of a suboptimal upbringing. Poor kids have an ineffective “operating system” and are weak in “the big five” which include: 1) memory capacity-short and long term 2) sequencing skills such as what goes first, second and third, etc. 3) emotional drive—the motivated capacity to push through obstacles, 4) processing skills – visual, tactile and auditory, such as phonemic awareness and 5) a champion’s mindset which says, “I can change, I can make it happen”. This operating system is the academic resource kit that makes school success possible. Without it, not matter how much or how little content you offer, kids will struggle. When we teach the core components of our brain’s academic operating system, students perform better. Each day of our lives, our brain adapts to our experiences. This newly changing brain now influences us. There’s a “chicken and egg” effect happening; we change our brains and our changed brain then change us. ACTION STEPS: The schoolage kid’s operating system has just five primary components. 1) begin with quality assessment such as the Woodcock-Johnson® III NU Tests of Cognitive Abilities (Woodcock Interpretation & Instructional Interventions Program, WJ III NU Audio, Universal Nonverbal Intelligence Test™ (UNIT™) and others to find out what each student needs. 2) Create a tailor-made skill-building program for students and sell them on the value of it. 3) Make sure the student is with a trained processional that keeps the students engaged and paying attention during the program. 4) Ensure that kids get isolated pull-out operating system building time with a commitment to 30-90 minutes a day for 3-5 days a week. Anything less won’t be very effective. Best ways to upgrade the operating system include arts, simulations, sensory- motor lab school, long-term projects and specialized computer programs. If you cannot afford, or can’t write a grant for the skill-building necessary, you’ll need a “low budget alternative. There are two of them, and they take a bit of space to flesh out, so I’ll leave that to our next meeting. These are just a few of the critical “sub-factors” that only work when they are in harmony with other factors. Without them, you have little chance. But with them, you still need the other, more basic and mundane, factors. In sum, we know that children of poverty often have suboptimal brains and we know that brains can change for the better. But you have to know how to do it and get the staff on board to make it happen. If you’ve read this far, you are clearly committed to change. I promised you some help and here it is. Take charge and start with making smarter changes. Learn more, change strategies and mindset. Check out my website and blog packed with resources at www.jensenlearning.com. Get others on board. Make it a collaborative effort. P.S. Whatever choice you make, be decisive and be bold; there is power and genius to it! (Goethe). Now, can you use what your learning about brain-based concepts and apply them to help us all solve the problems of poverty?